Back when I worked in the corporate world, our organization, like many, had a great, big invisible wall between marketing and sales. The marketers crafted messages, thought about fonts and brand colors, produced beautiful brochures and websites, and figured out new ways to get people to know our company existed. The end result of this work and money were “leads” — folks who might buy our product. The salespeople, a golden, confident team, took those leads and turned them into customers. In the five years I was with that company, I never saw anyone in marketing mosey on over to the sales floor and ask them what we could do to make their jobs easier. We did our piece and they did theirs, and that’s how things were. Officially, we were all part of the same happy family. There were meetings and initiatives. But unofficially, the marketing folks rarely made time to hang out with our selling cousins. Which is, when you think about it, completely bizarre. Marketing and selling are like salt and pepper. They just go together. Treating marketing and sales like two different things puts the focus in the wrong place. It focuses on the company’s tasks, rather than on the customer’s journey. Marketing and selling are just two different points on a person’s journey from stranger to customer. They’re different points, and the skills for one don’t always perfectly translate to the other. But sales professionals get a lot more effective when they think like marketers — shaping and expanding their roles in customer experience. And marketers get about a zillion times more effective when they think like sales professionals. The thing good marketers know is that not everyone should be saying Yes. Marketing, when it’s done well, is an invitation to a party. And a party that absolutely everyone is invited to usually isn’t as much fun. Marketers think about the ones who say Yes and ignore the rest. Traditional sales has often involved getting salespeople to hunt down and interrupt dozens or hundreds of probable “Nos” to find the one Yes. Which is brutal, painful work, and it can get people into bad habits. For example, the habit of “refusing to take No for an answer.” The habit that makes some folks hate salespeople. Because No is, in fact, an answer. Now (before all my sales pro friends rush in to correct me), smart sales professionals already know this. They don’t waste time or energy on people who aren’t particularly interested. They’re happy to get a No, because it means they can go out and put their time and energy into a Hell Yes. And they know that it’s their job to create a positive experience for prospects who want to say Yes, but need to iron out a few details so they can move forward. I think this one is simpler. If you want to market well, you need to get over your discomfort with selling. But in the digital world, the line gets a whole lot blurrier. What we call a “content marketing campaign” slides into “copywriting” when it’s time to persuade. And the truth is, it’s really handy to be able to address a selling situation with confidence, like a webinar, a live presentation, or a face-to-face meeting with a potential client. Selling is a set of skills, and like many other skills, it works better when you bring your own personality and individuality to it. You don’t need the stereotypical “sales personality” to excel at selling. In fact, some of the most high-powered salespeople I know are remarkably quiet and introverted. They’re fantastic listeners — and listening is one of the most important skills a sales pro ever learns. For my sales professionals reading this — your life will become so much better when you see yourself as part of the larger customer experience, and see your role as a guide and a creative problem-solver for your prospects. And for my marketers who might need some help with your selling skills — take a deep breath. Okay, take another one. You’ll learn comfortable, doable skills that will increase your confidence and your effectiveness. And you’ll actually be able to sell your services, your courses, your ebooks, or anything else you might want to offer your customers or clients. Your gorgeous content won’t do you any good if you don’t have the skills to sell your product or service when the time comes. We originally had Tim scheduled for an earlier date but we needed to reschedule. The new date is Tuesday, June 26, at 12:00 Noon Eastern U.S. Time. As a card-carrying sales wimp myself, I love Tim’s approach. It’s relaxed, it’s the opposite of “pushy,” and it’s all focused on simple things any of us can learn to do well. This is a fundamental problem with many companies Sonia. Although departments have specific roles it is like walls prevent said groups from working together to create a seamless experience for the customer. This is why I enjoy being an entrepreneur building from the ground up; as I grow, I do things in flow, and as I scale, help folks see the benefit in creating a customer experience before getting all caught up marketing or sales speak, boxing themselves in. 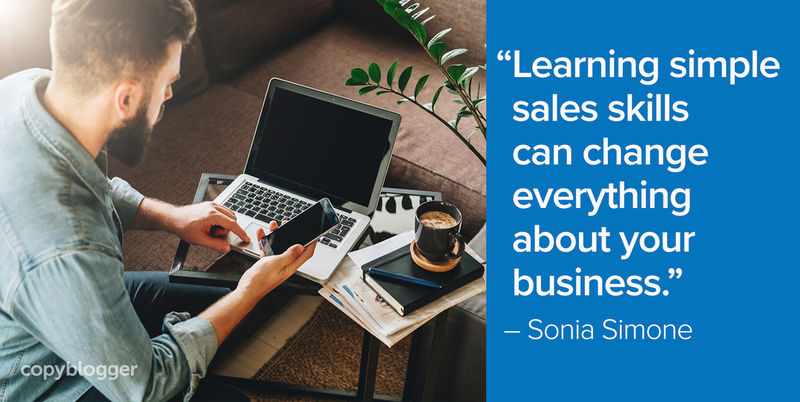 I agree with your main message Sonia – sales and marketing are intertwined, regardless of how the processes are viewed/practised by anyone. That said, there are distinct differences between the skill sets involved in each. The customer/client journey begins at the promotion stage and works its way through marketing to sales – therefore each stage is a relay race and must handle the baton effectively for its own part of the race (journey). Good marketing opens the process and creates questions (the correct questions) for sales to answer. Sales completes the education and helps the client to make the right decision to buy her solution (presupposing that the solution is right for the client). That people treat the sales process with suspicion, even fear, is simply a matter of confusion and misunderstanding! The most effective sales are non-sales, where the client decides to purchase from a position of choice. Remarkably, everyone uses sales skills everyday without realising. The most effective sales skills are wholly based on the powers of communication and interaction and we therefore need to study and hone these skills to produce the best sales – Highly Effective Sales (HES). The awesome bonus is that with these skills, selling becomes not only truly effective, it also become amazingly simple and easy! Having lead both Marketing & Sales Teams, I’ve stumbled through trying to get the “silos” to understand everyone’s’ roles and work together better. One of the key takeaways is that the conflict arises from the fact that depending on the size/age of the organization, Marketing’s role changes while Sales stays relatively the same (only the scale changes). I find it provides an interesting context for building understanding in both departments. As someone who has spent over 15 years in B2B and B2C sales, I fully agree with your assessment of the silos that marketing and sales departments tend to operate, especially in larger corporations. I can’t remember the number of times where the sales team would argue with the marketing department telling them that the messaging was off and that customers wouldn’t buy into the marketing message. Or the number of times when the marketing department would force us to use marketing materials that were useless to the sales team because they didn’t talk to each other. As someone who is now in marketing, I agree that sales and marketing really should be intertwined and marketers should have sales skills and salespeople should have marketing skills. Sales is about offering a solution to a need or a problem and to me, marketing is really about making sure the solution is perceived to be a good fit for the need or problem. Hey! I recently started a blog and have been researching other people for inspiration. I want you to know that this post hit me really well in combination with a recent experience I had. Thanks for taking the time to write about the fine line between marketing and sales!